Burgers are a favourite meal for my family. To me there is always something special about a meal that I can pick up and eat with my hands! For my family, well, who doesn’t love a burger! 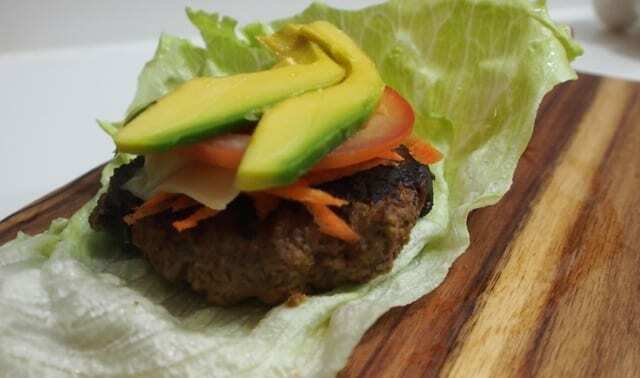 Making a low carb version of a traditional burger can be a challenge, but can be done. Instead of burger buns, use a grilled Portobello mushroom for your burger top and base, ice-burg lettuce leaves to wrap the burger patty and chosen fillings, or a slice of beetroot or cheese on either side of your patty. Salt, pepper, chopped parsley, coriander or herbs of your choice. Mix all ingredients together in a bowl. 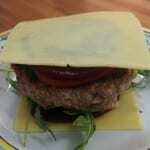 Roll mixture into balls and flatten into patties, leave to firm in the fridge for around 30 mins. This will help to keep the patties from falling apart while cooking. Cook for around 10 mins in a bench top grill such as the George Foreman Grill, or pan fry in coconut oil. Always make sure your oil is hot before adding patties to the pan, you need to hear that oil sizzle. If the oil is not hot, the patty will stick to the pan and fall apart while cooking. Serve with grated carrot, sliced tomato, grated cheese, sliced, tinned beetroot, and/or any favourite salad vegetables. Serve with home-made aioli. Note that nutritional break down includes patties and only. Added salad vegetables will add a little extra carbohydrate. If you are serving with Aioli, fat content will increase, not carbohydrate.